Amedeo Clemente Modigliani (July 12, 1884 – January 24, 1920) was an Italian artist who worked mainly in France. If you are not familiar with this artist he was famous for his paintings of elongated faces with long skinny necks. 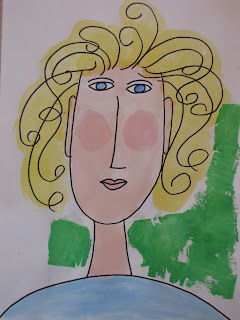 His drawings were simple and stylized. This is a fun lesson to do with all ages, and I have added the tissue paper background for an extra twist, since the face painting can be a fairly quick project to do. 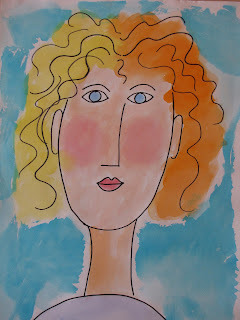 I begin this lesson by showing some of Modigliani's portraits. 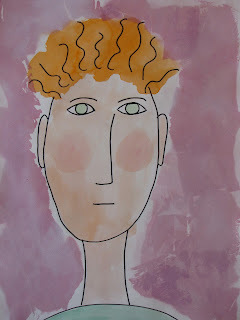 I talk about the long skinny faces and necks, and the almond shaped eyes,simple nose, and small rosebud lips. Starting with a big skinny U shape, I have the students practice a simple face drawing in this style following my steps as I do it on a white board. For fun I have them do simple curly lines for the hair. If I have already done a portrait lesson with them I point out the difference between a more realistic portrait; the shape and size of the features, and the placement of them compared to Modigliani's faces. Next I have them do a large drawing of the face on the watercolor paper, filling up most of the space. After they have done it in pencil, I have them go over all the lines with Sharpie. Then we watercolor the faces. I let them have some freedom with the hair, making it two tone if they want, and just painting it loosely around their Sharpie lines. After they have done the painting part then we use small pieces of tissue paper to fill in the background putting water under and over each piece with a brush and overlapping them. When the tissue dries we pull that off, and you end up with a textured looking background. 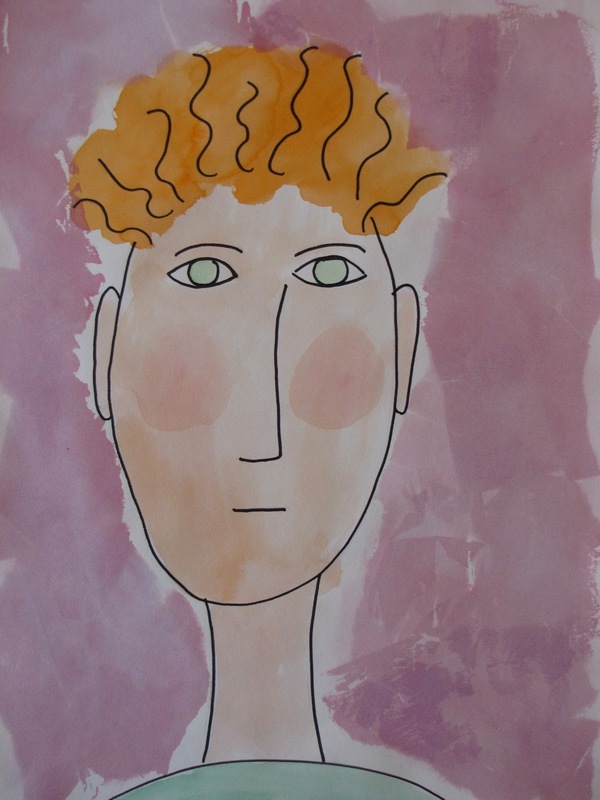 This project is a fun one, and good for a variety of ages, plus it really captures the Paul Klee style. The secret ingredient is bleeding tissue paper. I use the Spectra Deluxe Art Tissue from Nasco Art Supplies. I have also purchased some art "bleeding" tissue paper at Michaels which did not bleed, so I am not sure if that is the problem with other art tissues or not. 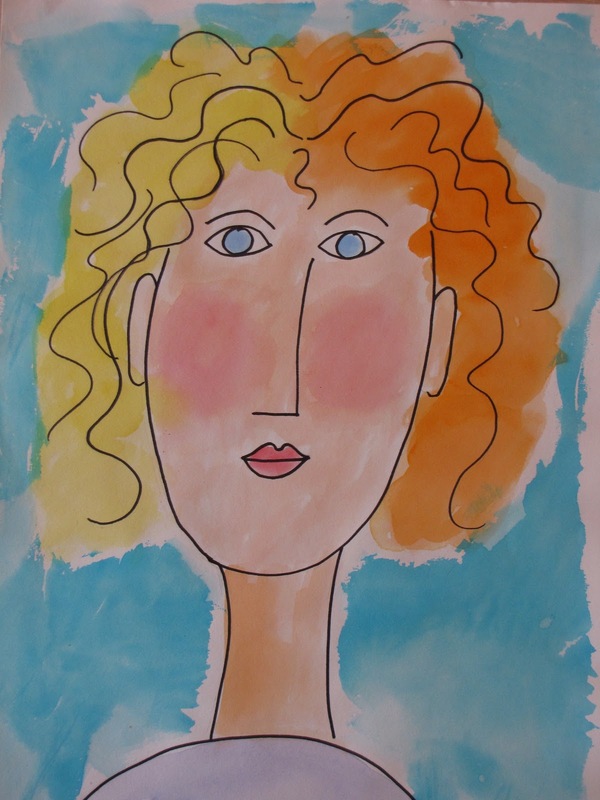 Students start by drawing a simple Paul Klee style face (see sample). Go over the pencil lines in a dark crayon. Then use tissue paper cut in about 2 inch squares to cover drawing brushing water under each tissue square. You need to be careful to get enough water down to make the tissue bleed but not so much that the water puddles. Let the tissue dry a few minutes and then peel off. You will have beautiful soft color that is blended here and there. This is one of my favorite "go to" lessons that I have done many different ways with many different ages and sizes of classes. 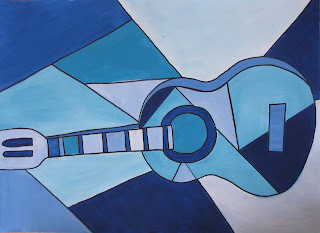 I like using the guitar as subject matter because it has all the different lines in it and can be as detailed or simplified as you like and still look like a guitar. It is also a great lesson to teach about composition and color mixing. I start the lesson by talking about Picasso and his use of musical instruments as the subject for many of his paintings. I also talk about his "blue period", and Cubism. 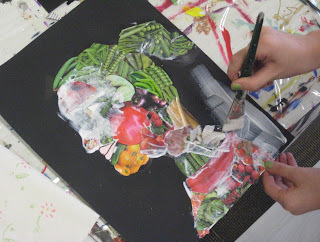 This lesson is based on the amazing art of Giuseppe Arcimboldo. If you have never seen any of his work-you need to look him up. I have used Arcimboldo by Taschen and Hello Fruit Face! to start off this lesson. Lots of great photos of his art. To have the best resources for this project, get your name on the mailing lists for some vegetable/fruit seed catalogs and some flower seed catalogs. You can also use floral scrapbooking paper clip magazine pictures, but you need a lot so I don't recommend this. Depending on what age you are doing this lesson for you may want to pre cut some flowers and fruits and vegetables.